Join us on a snow-filled activity holiday in Eastern Finland. Our weekend combines a whole host of winter activities including snowmobiling, husky sledging, snow shoeing, cross country skiing and we can even try our hand at ice fishing! Try and spot the magnificent Northern Lights! We will visit a husky farm were we can enjoy the best way to travel in Finland… by husky! Take part in a husky sleigh ride and we even have a go at driving them ourselves! What better way to get to the husky farm than by snowmobile! 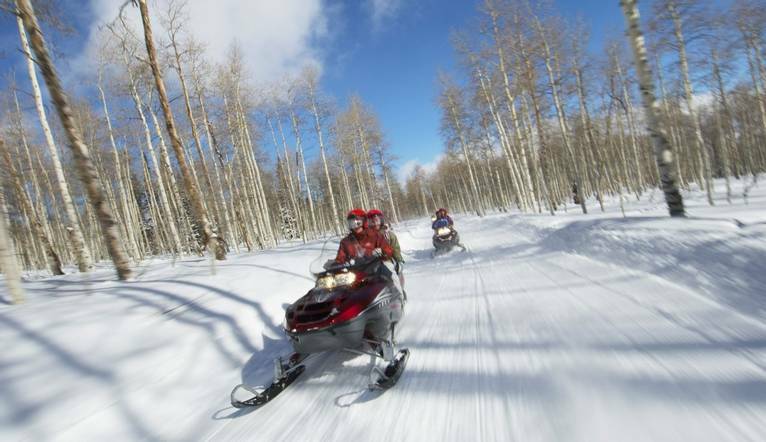 We will have the opportunity to do a snowmobile safari through the pine forests on a 2 hour excursion. Frozen Lake Experience and Snow Action! During our stay we explore the Taiga Forest and frozen lake on a two hour snow-shoe excursion. We also try our hand at ice fishing on the frozen lake, learning all the traditional techniques. We will also enjoy learning cross-country ski skills at the local ski school. All equipment is provided for our included activities, plus use of kick-sledges and sledges are available for the duration of your stay. After all our daytime activities, what we’ll need are nice relaxed evenings and that’s exactly what’s on offer at our hotel! On returning from our days of adventure you have access to the onsite sauna and Jacuzzi to relax your aching muscles. Or brave the cold for a lake-side sauna – immersion in hot water followed by a leap into the lake; not for the fainthearted! Included in our trip is a traditional Finnish smoke sauna. Our destination for our adventure holiday is the Wild Taiga region in Eastern Finland. The region is a wonderful destination for winter activities (with eyes peeled for the Northern Lights) and famed for its wildlife as it is a landscape surrounded by hills, forests, lakes and rivers, which are home to moose, reindeer, and large carnivores including the brown bear, wolverine, grey wolf and lynx. The transfer time from Kajaani Airport to the Hotel Kalevala is approximately 1.5 hours, depending on weather and traffic. We recommend dressing in layers with warm, water/windproof casual daytime wear and comfortable, warm footwear, thick socks, gloves, a warm hat, thermal underwear and sunglasses. Please note thermo outer wear clothing is provided for the snowmobile safari. In the evenings, the casual, warm clothing is recommended. We suggest a Group Collection to cover transfer drivers, and hotel staff of €25.00 per person. Your Tour Leader will collect this on your behalf and distribute it accordingly, thus relieving you of the burden of who, when and how much to tip. The tipping of housekeeping will be left to your individual discretion (a small amount left in your room on departure should cover this and would be much appreciated). As is customary, ‘the hat’ will be passed around for the driver and guide on all optional excursions. For any meals that are not included in your itinerary, or taxi fares, your Tour Leader can advise of an appropriate Ͽo add on.